Silvia López Chavez is an artist and designer focused on public art and social activism, who is motivated by the power of the creative process as an agent for positive change. Her work investigates our basic human need to connect with each other on multiple levels: socially, environmentally and culturally. She explores the intellectual and emotional narratives of joy, struggle, acceptance and assimilation, as well as, the change and growth that affect daily life. Chavez has a multi-layered process that includes experimenting with medium, color, line, repetition and form while finding balance between representational and the abstract. With roots in the Dominican Republic, López Chavez has based her artistic practice in the Boston area for over fifteen years. 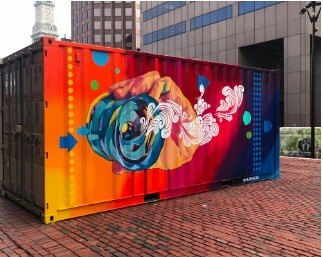 Her latest mural projects can be viewed throughout the city at Northeastern University’s campus, on the Charles River Esplanade, in Brookline, Allston, the North End, Downtown Boston, and Central Square, Cambridge. She continues her studio art and design practice at the Boston Center for the Arts in the South End.